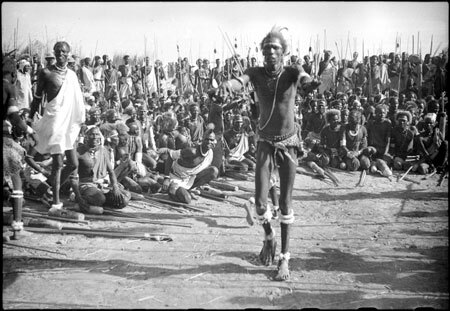 A group of Dinka men sitting at a funeral dance near Malakal, with a man dancing with arms outstretched towards the camera in the foreground. Dances were frequent occurences, often accompanying events such as marriages and deaths. Morton, Chris. "Dinka dance " Southern Sudan Project (in development). 03 Jan. 2006. Pitt Rivers Museum. <http://southernsudan.prm.ox.ac.uk/details/2004.130.36641.1/>.